We continute to receive great press reviews. We will post them as they become available. The first features Kazuo Yamane's daughter Joyce, talking about the significance of her father's service. It can be seen by clicking here. The second features Joyce and the film's coproducer Lucy Ostrander. It can be seen by clicking here. The International Examiner published an in-depth interview with filmmakers Lucy Ostrander and Don Sellers about producing the film and what it means to them. Read it here. "From the complex history of Hawaii, our 50th state, comes this unique story of the struggle to combat prejudice and find one’s rightful place in this nation. “Proof of Loyalty: Kazuo Yamane and the Nisei Soldiers of Hawaii” tells the story of a Japanese American who played a crucial strategic role in World War II." The Hawai'i Herald published a detailed, enthusiastic review of the film for our screenings at the Hawaii International Film Festival. Read it here. "...you will exit the theater with a greater understanding of Hawai‘i’s history and an appreciation for the depth of service the young Nisei stepped up to perform when the odds were against them." "... superb narration, contains remarkable quality for war footage, and richly blends the stories of Yamane’s youth with his superior war-time service and numerous high-quality photos of family and friends." We received a very positive review (3.5 Stars, Highly Recommended) from Video Librarian. "The story of Nisei (American-born children of Japanese immigrants) in Hawaii is told in this excellent documentary by filmmakers Lucy Ostrander and Don Sellers. 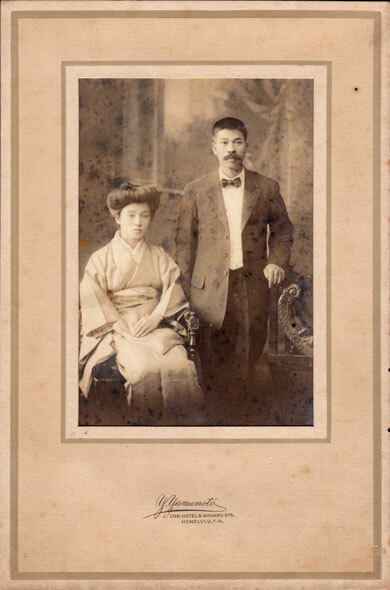 Following Hawaii's annexation in 1898, Japanese immigrants became the preferred laborers of plantation owners, setting the stage for a long, complicated relationship during the 20th century between the newcomers, their offspring, and the federal government.... Proof of Loyalty touches on assimilation, denial of citizenship to Japanese immigrants and discriminatory schooling for their children, and the maintaining of cultural ties with the old country, but ultimately it focuses on Kazuo Yamane, the son of a successful merchant in Oahu, who attended a top college in Japan and received military training. ...Combining archival materials and interviews with historians, Proof of Loyalty presents a powerful story of the cultural, political, economic, and legal forces that propelled Japanese immigrants and their descendants to become a vital segment of the American population." "This fascinating documentary chronicles the Nisei (American-born children of Japanese immigrants) in Hawaii and their contributions toward the U.S. war effort during World War II. While the film examines the Nisei in general, the focus here is on Kazuo Yamane (1916–2010) and his important war work. Yamane was the eldest son born to a large family of Japanese immigrants. His father was a successful businessman who was able to provide opportunities for his children unavailable to many other Nisei. Upon graduation from a prestigious Tokyo university, Yamane was drafted into the Hawaii National Guard, eventually joining the army’s 100th Infantry Battalion and the Military Intelligence Service (MIS). Throughout the war, he demonstrated loyalty to and patriotism for the United States. While his knowledge of Japanese culture and language generated huge benefits for the service, perhaps his greatest contribution was his discovery of the Japanese Army Ordnance inventory, which some feel helped shorten the Pacific war. The use of historic footage and photos together with interviews from historians and veterans holds viewers’ interest throughout." VERDICT - This well-conceived documentary flows smoothly and is highly recommended for high school/college libraries and viewers with an interest in U.S. military history. Educational Media Online gave the film a Highly Recommended rating. "The Nisei combat units and translators proved the loyalty of Japanese-Americans beyond question. Had any of them broken the faith, they all would have been indicted. But they did not. The returning veterans helped democratize Hawaii and were the pioneers for eventual statehood. This is a strong story of diversity but also a story of immigrant success in the face of discrimination. This film will work well in high school and college classrooms as well as for those interested in World War II history." In association with the Port Townsend Film Festival's Women in Film event, Lucy Ostrander did an interview for Port Townsend radio station KPTZ, conducted by Program Director Larry Stein. You can listen to it here.